It's rosé season, and we dive into the pink wine's rise in popularity, top styles and regions, and how to pair this diverse pour with your favorite food. In this week’s episode, we talk about the wine of the season, rosé, and chat with rosé experts on its rise in popularity, different styles and regions to check out, as well as how to pair the pink stuff with your favorite food. This season, drink real wine with real people. Look for Collection des Anges rose at fine wine shops everywhere. Susan Kostrzewa: Susan Kostrzewa, executive editor of Wine Enthusiast Magazine. In this week’s episode, I talk about the wine of the season, rosé, and chat with rosé experts on its rise in popularity, different styles and regions to check out, and how to pair the pink stuff with your favorite food. Nils Bernstein: I’m Nils Bernstein, food editor at Wine Enthusiast. SK: Rosé to me is one of the most pair-able wines on the planet, and I want to know why you think that is. SK: Ooh, you just hit two of my favorite things in the world. Thank you for reminding me of that. NB: I didn’t just say that for your benefit, but I think it’s absolutely true. SK: But I am happy about it. NB: But in general, I think rosé, it can pair with almost anything because of course it straddles the white and red sides. you can think of it as kind of a fun, maybe fuller-bodied white, you can think of it as a lighter red. But, of course, it’s in its own category and it can kind of straddle the pairings that you might do, that you might go more white toward or more red toward. Rosé can usually handle both. SK: Well, and there’s so many rosés being made now from in different regions with different grapes, obviously. SK: Talk a little bit about the diversity of flavors within the rosé category that you’ve noticed. NB: Yeah. I mean, I feel like not that long ago most of them had a very easy, very fruit-forward, very light kind of easy drinking, outdoor barbecue, summer kind of vibe. I’ve been tasting so many more, for lack of a better word, serious rosés. Not even necessarily … Sometimes people kind of associate color with strength or drama in the rosé category, but I’ve had some incredibly complex, savory, pale rosés. SK: Well, that’s actually really good as a consumer, as a wine drinker, when you go to a wine shop or you’re in a restaurant. Yeah, you shouldn’t assume that if something has a dark color or a dark pink color that it’s gonna be a heavy rosé or a heavy wine because as you said, color doesn’t always determine the sweetness level or the dryness level. NB: Right. Or the alcohol level. And so, it’s been really interesting to see where there might be a really full, complex, pale rosé that I might have with duck for example. And then, there might be a really juicy, berry-forward, dark rosé that I might have with a salad. I don’t know. It’s just interesting to play around with them because they’re so flexible. It’s fun to kind of put one down in front of every course, or if you’re at a restaurant get any that they have by the glass and just see how it feels with different dishes. SK: What are some of your foods that you really love pairing with rosé? NB: I think one thing that I like to think about in terms of rosé is, again, people think of it as a very easy-drinking wine and they might be tempted to pair it with very simple or lighter foods, but rosé can take a lot. I mean, I like it with grilled sausages, with … You think about Provençal rosés with Mediterranean cuisine. You’re talking garlic and peppers and olives and onion and rich pastas. It can stand up to that. Obviously rosé’s from Provence and that Mediterranean cuisine from that area is a classic pairing and it can really stand up to those kind of powerful flavors. SK: Well, we’re actually in a restaurant that specializes in Mediterranean cuisine. NB: Yes, we are. Well, we’re at Ousia, which is one of my favorite Greek restaurants really in the country and certainly in New York. They have a great wine list. They pour a lot of rosés by the glass in the summer, and I think you’re looking at a salad of feta cheese and tomatoes and olives, a philo pie with wild greens and herbs, lamb cooked very simply with a light touch with a lot of herbs and garlic. Those are foods that are incredible with a range of rosés. I think those really powerful herbal flavors can be really beautiful with rosé. SK: And definitely not just … I think the assumption or maybe the association with rosé is light food. It is salads, seafood, light dishes, but it does really, really well with heartier dishes. NB: Yeah, get a few rosés. SK: Yeah, exactly. A few rosés. See if you can trip them up. NB: I think rosés are great with pizza. They’re great with almost anything you would grill. They’re amazing with charcuterie, pâtés, smoked and cured meat. I think they’re great with egg dishes. Rosé for breakfast is … Can I say that? SK: I can’t … Oh, yeah. Can you? You should. NB: Is good with omelets, quiche is really great. SK: Oh, that sounds amazing. Why do you think rosé as a category has gotten so big in the US? It seems to be continuing to grow, but why do you think that is? NB: I think a lot of times we talk about rosé as a trend, but also there’s a lot of … The quality of rosés in the country has improved hugely just in a really short period of time. I think part of it is that the rosés that people have access to at a really good price point are a lot better than they were two, five, 10 years ago. SK: Right. So, the access to great rosés is greater and just the actual volume of good rosés has grown in the US. SK: Not only in the US, sorry. Worldwide, really. And I think people’s pallets have evolved, and we talk a lot about this at the magazine, how the American pallet has evolved so much as far as food goes for sure. SK: Just understanding nuances, regional cuisine, really being more discerning and more experimental, and I think that’s part of what’s really fun about wines like the rosé category is they sort of follow suit and they’re going along with that evolution. They’re great food wines but they’re also … It’s a category that has a lot of diversity within it and I think people are excited to give it a shot and try the different styles. NB: And I think the way that we eat now where you’re talking about a lot of different flavors in one meal. You might be sharing a lot of different courses, you might be having a dish that maybe has an Indian influence next to a dish that has a Spanish influence, and rosé can bridge a lot of those really strong flavors. SK: Okay. So, where when you in your mind, just a flash, when you think of drinking rosé, where are you? NB: I can’t help it. SK: Okay, so you’re in Provence but what are you doing? NB: I am renting a house with friends. Someone else is firing up the grill while I’m at the market shopping for seafood. Cheese, somebody is putting together a cheese and charcuterie platter while I’m preparing the fish and meat for the grill, and we’re basically uncorking a million rosés and getting ready to have a giant outdoor barbecue. Well, speaking of rosé, we have Kamal from Ousia walking up to the table right now and handing us two glasses of rosé, which … Oh, yeah. I mean, these look delicious. SK: KK is a wine director here at Ousia and he is also an expert in Greek wine. We were just talking about categories or we’ve been talking about categories in the rosé sphere that are growing, and Greece is one them, and Greece has some really amazing rosé wine. So, what do we have here? KK: So, in your first glass, I poured you the Alpha Estate Rosé. It’s 100% Xinomavro from the northern Greece parts, a region called Florina in Macedonia. A very cool climate region, so something very unique. A lot of people don’t associate cool climates with Greece. In fact, that’s the only thing they know is beaches and sand. So, those are different. That’s why I wanted to show you something very crisp, very lean, very fresh. A lot of customers of ours, they are into rosés like these, so you see a lot of people asking for rosé, but also there is the people of rosé that really enjoy savory ones and then that’s one of them. It’s not the fruity side but more savory character because of the grape Xinomavro. SK: Yeah. We were talking about, just within the rosé category, all of different styles you can find. And then, even within say a category like Greek rosé, all of the diversity you can find depending on where it’s grown, what the grapes are. Like you said, there are a lot of people who maybe they prefer a more robust style of rosé or more herbal style of rosé as opposed to something that’s fruitier, that sort of thing. Well, cheers. NB: So, what would you pair this wine with? KK: This is screaming for something from off the grill with summer upon us and ahead of us, so something grilled. Something with lamb would be fantastic grilled, if you want to do it. Even some seafood grilled. I would love to do it usually at home. We’ll get some lobsters, we split them, put them on top of the grill with some lemon, where the rosé works very well. That’s the unique thing about the Greek rosé as well. SK: The color’s so beautiful. I think, again, you can’t get around how beautiful rosé as a wine is, just in the glass. This one’s a really, really nice pale pink. But again, it’s deceptive because it has that very pale color but there’s a lot of flavor in here. KK: Yeah, different. It’s made from Xinomavro. That’s the big, robust, intriguing variety that’s gonna give you some bold red, but when it comes to rosé, it still gives you some structure with a lot of diverse flavors as you taste it. The unique thing about this is the minerality and the crisp character of it just can stand to a lot of food. Not only Greek food, but you can try it with any other … A nice burger with some manchego cheese and some bacon can do very well with this, you know? NB: That’s another thing. Most rosés go really well with most cheeses, and it’s not always a wine that people talk about with wine and food pairing with cheese, but that’s nice. KK: Yeah. Rosé is a very versatile grape, and especially for me, understanding Greek rosés from … As, Susan, you said, they come from different parts of Greece, different grape variety, the savoir faire of different style of winemakers. The umbrella becomes so huge and you can satisfy a lot of pallets when it comes to rosé. SK: So, we have another wine on the table that sort of … The color is so different. We went from a very pretty salmon, pale pink wine. This one’s got more of a ruby color to it. So, tell us what the second wine is. KK: It’s called Granato’s, pomegranate basically. It’s by [foreign language 00:12:43] Attica, Athens, and it’s a blend of cabernet sauvignon and an indigenous grape called Agiorgitiko, which usually grows in the [inaudible 00:12:54] but it’s grown all over Greece right now. You can see it is the color as Susan described, very vibrant, again structured, good acidity, minerality. It’s just what the land of Attica gives you. Sunshine in a glass. That’s what you see. You see a little bit of power behind it. Again, cheeses, no doubt, blue cheese, something more pungent, grilled meats, seafood. It’s versatile, meaning you go to a party and everybody brings food, bring a bottle of rosé and you’ll be safe. Everything goes with it. SK: And again, I think you said it’s summer in a glass type of thing. There is an association with it that’s just so pleasant and it really makes you want to … Nils was talking actually about where he imagines himself when he drinks rosé, and he said that he would be grilling outside in Provence. What about you, KK? KK: Definitely on a beach in Greece by an island, one of those islands. There’s thousands of them, so I’ll say a little bit in island of Tinos, the lads grilling by the beach. Like I said, grilling his seafood. You will not go wrong with either place, you know? NB: I’ve noticed with a lot of the Greek rosés that I’ve tried and I’ve been lucky enough to try, a lot of them at your restaurants, there’s kind of a savory, herbal quality that, as different as they are, they share this kind of savory undertone. Do you find that also? KK: Most definitely. That’s what I mentioned earlier. They are more savory then fruity. I feel that [inaudible 00:14:26] has something to do with it. They have sense of place, which that’s what I enjoy about them. We’re serving six rosé at Ousia right now. From each rosé, you get different nuance and flavors of [inaudible 00:14:39] and you can see the savory element. Most of the Greek, organic, the grape, so there is that almost integration between the land and the grape. I know it sounds easy to say, but that’s the truth. It is less manipulation, the win is more about simple, easy-going. Take care of it in the vineyard and then the wine will transport you across. SK: KK, why do you think rosé has become so much more popular in the US over the last several years? KK: You did, guys, a great job by talking about it and promoting it and making people understand because a lot of people didn’t understand rosé. People think about rosé as a [inaudible 00:15:20] bad wine, a mix of two maybe, white and red. So, a lot of people don’t understand rosé. Rosé is very serious wine. It’s a wine that is … Same time, you can have fun with it, very versatile, can cover a lot of aspects of palettes, that’s the unique thing about it. Most difficult pairing, you can turn to rosé. That’s what helped. You did a great job by promoting it. Now, you see people getting better at rosé. You want to try something different, you want to … The palettes of the rosé drinker evolved also as well. That’s what’s happened with rosé in the last few years also. SK: What are some other areas in Greece that you think are exciting as far as rosé culture? NB: So, it sounds like everywhere in Greece, from every grape, they’re making rosé. SK: You make those words sound so easy to pronounce and read. KK: Only took me 20 years. Don’t be afraid to go to a wine shop or restaurant and ask for Greek rosé. Go with one and I think you’ll enjoy it. Just look for fresh rosé [inaudible 00:17:32] is very important of course even though some of them age very well, and you will do good. You will have fun with them. Rosé is something unique, when you try something new, something more exciting. 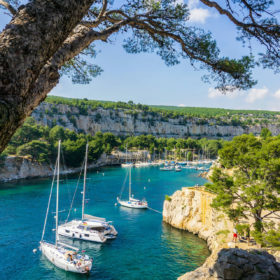 I know Provence is Provence, but it makes a fantastic one no doubt, but you can step out of that and try something very different and I’m sure you’re not going to be disappointed. With other countries as well. NB: And eat it with a lot of lamb and wild greens and feta cheese and olives and you’ll be happy. Pierrick Bouquet: I’m Pierrick Bouquet, cofounder of Pinknic and La Nuit en Rosé, two large rosé wine festivals and also a rosé ambassador. SK: So Pierrick, obviously rosé, as a category, is blowing up in the US. It’s been amazing. I like in New York City and I feel like in the last five years, every spring or summer that I look in wine shop window, the rosé bottles grow and grow and grow. So, it’s obvious that there’s a big trend and there’s a big movement towards more rosé going on and I kind of feel like you might be part of that. So, I really want to talk about your events and really how did La Nuit en Rosé Rosé start? What was your inspiration for founding that? SK: So, maybe not enough of sort of the lifestyle around the wine. PB: Exactly. With rosé that was an opportunity to create much louder experience and incorporate wine, food, and also the occasion of drinking rosé. So, La Nuit en Rosé started as a rosé [inaudible 00:19:53] concept and this is why actually it is still very popular as of today. Just because we are a little different around the water … It’s a simple idea, but someone had to do it. PB: I might not have worked with red wine or white wines, probably worked very well rosé because when you drink rosé, you want to be transported to a different place and I feel like being on [inaudible 00:20:16] the weather, give you this feeling. SK: Yeah. I really believe that rosé, as a category, there is something about the lifestyle of it. Almost more than any other wines, there’s something about … Really, when you drink it, you think of the places that you’ve been when you’ve had it, on a beach, or on a boat. Why do you think that is? Why do you think it has such a transportive element to it? SK: I mean there are obviously great and beautiful rosés that are made, but in general, as a category, I think you’re right. It’s something that most people can enjoy, can understand, it’s delicious, it’s refreshing overall, even within the different categories. So yeah. PB: Exactly. That’s kind of the message I’m pushing through these events. I don’t want to make rosé complicated wine to understand. I don’t want this to be another category of wine where people feel like they don’t have the knowledge enough to approach this wine. But this is what we’re seeing, a much younger generation being so interested in this category of wine. You’ve been to my events, you’ve seen mostly women in their late 20s, early 30s that are all about this wine. SK: Mm-hmm (affirmative). Yeah, I think that in the early stages of it really getting popular in the US, it was mostly younger women that you were watching and seeing interested, but now because it’s such a food wine, that I think it’s really starting to expand beyond just that small category of wine drinkers. It’s really becoming anybody who’s really into food, which of course now you’re getting all the guys involved, people who enjoy … a lot of the sparkling wine people, champagne people are drawn to the rosé. So, I think, even at your events, I’ve seen a change in who’s there. It’s a lot more of aa diversity of ages, of people, of gender. So, I think it has that ability, as a category, as a wine, to appeal to a lot of different people for different reasons. PB: That it true. At our events, we try to actually create different experiences to attract a different clientele. We also organize wine pairing dinners where we only feature the most expensive, the most high end rosé curated on the market today. We are actually launching [inaudible 00:23:35] this summer and we’ll kick off the festival with a rosé wine pairing dinner where the goal is really to showcase the versatility of this category and see what are those top rosé on the market today. SK: Are you expanding into other markets? So, if people listening to this are interested in going to some of the events, they can obviously not just have to come to New York. Where else are you doing these or do you want to do these? PB: Yes, I want to expand even more. Right now, we are in Miami, Los Angeles, New York [inaudible 00:24:09]. We want to expand beyond those four markets, however we are very cautious about where we want to go next. We’re thinking Texas. It’s a market that we are really interested in that we would like to educate people on rosé. Something that I didn’t mention, the reason why I started La Nuit en Rosé was really to educate people on this category of wine, show the diversity of this category that is not just [inaudible 00:24:38] all rosé are sweet. It stared with the simple idea, now people already know that, so now they idea is really to show new reasons here we’re testing actually a Greek wine. Greek has been coming up with amazing rosé lately, Italy has been coming up with amazing rosé, so, it’s not just about France anymore. We’re talking about USA, like a lot of California wineries or New York based wineries are making rosé, amazing rosé. They’re using techniques from Provence, they’re using grape varieties used in the south of France. We’re starting to see on the market an amazing diversity and so I’m very proud of La Nuit en Rosé because this is where we’re showcasing and this is the full spectrum of rosé. SK: Yeah, I mean I actually love that your events encompass global rosé, so it’s rosé made from all over the world. It’s amazing. It is incredible the diversity of rosé that’s being made. And like you say, the quality level’s really come up, so you can experiment. It can be a rosé from Hungary, it can be a rosé from California, it can of course be a rosé from [inaudible 00:25:48] or from Provence, wherever, the quality levels are there and it’s also just a fun wine to drink, as we were saying. Again, there is such a lifestyle connection to these wines and I think that’s part of why it’s really fun that you’re doing the things that you’re doing. One of the other things I want to mention that [inaudible 00:26:10] something called Pinknic. Can you talk about that a little bit? PB: Pinknic, it’s all about the experience of drinking rosé. So I was talking about La Nuit en Rosé, be more on the education side where we showcase a lot of wine from a lot of different regions and we pair the wine with the different type of food. At Pinknic, this is an outdoor picnic and music festival which for us is the best moment, the best time to drink rosé. It’s the first weekend of the summer, between the 24th and 25th, in the perfect setting, [inaudible 00:26:45] we’re not on a boat this time, but we’re on an island. SK: This is New York, by the way, if you’re not from New York. PB: This is still in New York. But, same thing, we will expand to other markets in the near future and it’s a very large scale event. Here we’re talking about having 12,000 people come up for the weekend and drink rosé all day while listening to some beautiful artists, mix of bands and DJs. We pair the wine with a lot of different type of food, we have a food court this year, we are actually adding a pool. People also have to dress in pink and white or pink or white. So we create an aesthetic which is actually also very important and part of the experience. So, we’re very excited about the event this year. SK: Yeah. We at the magazine talk a lot about the context of wine. So, there is obviously the need to talk about the technical elements of the wine, to rate a wine, to talk about the quality et cetera, but there’s also, I think, we’re all getting better at telling the story of how to incorporate these wines into your lifestyle and I think most people want to know. I love that you’re incorporating sort of the whole picture and you’re offering all of that. I think that’s why those events, your events have really picked up. I would like to talk to you a little bit, being the rosé ambassador that you are and the rosé expert that you are, I’d love for you to talk about maybe the first rosé you tried that really sort of knocked your socks off, if you remember, like, “Wow, that was incredible.” But first, tell me where in France you’re from. SK: You’re from Paris, okay. PB: There’s no rosé wine made in Paris. SK: Yeah. Well, but there’s a lot of rosé wine drunk in Paris. Okay, but maybe as an adult, that wow rosé that you might remember now. PB: Yeah, what I remember is that my parents really liked the rosé from the [inaudible 00:28:39]. I remember having beautiful Sancerre rosé on the table. SK: I love Sancerre rosé. PB: And this I think in my mind, and still nowadays, the quality I think also increased tremendously in terms of Sancerre rosé on the market today. So, this rosé made of 100% pinot noir, it’s beautiful in terms of acidity, minerality, and that the kind of rosé I like because I like my rosé with food. And so, when I pair wine with food, I will go with Sancerre rosé first choice. SK: Mm-hmm (affirmative). Again, can’t go wrong with the good Sancerre rosé. Would agree with that. But, what are some that you think are really excited, some areas making rosé that are up and coming maybe that you think are worth talking about? PB: Some of the reason that I look for are Corsica. Corsica is a beautiful region for wine, not just rosé, but 60% of their production’s actually rosé. Most of the people don’t know that. You can find a great diversity of rosé in Corsica, the Corsican rosé from the north part or the south part are going to be really different. But yeah, Corsica is definitely an interesting region competing with Provence big time in terms of variety and diversity. Same price point category. They are not cheap wines, but the foods are delicious. Then, I’m really interested in American rosé. I think that’s where France has to worry about, especially Provence should be really careful there because we’re starting to see amazing wines made here in The States. I believe America will make rosé as good as Provence rosé and then people will drink local. SK: Well, I mean I think that’s a good point for the consumer, for the listener, you have so many great options, don’t be afraid to experiment, for people in our industry, don’t get too comfortable. There’s competition out there which is, I think, healthy but it does sort of change the dialogue. So actually, rosé is a category, again, I would say it’s been, would you say about five years since it’s really been very obviously blowing up on the market? PB: Oh yeah, definitely the last five years. I think we can trace back this when if you look at not just wine publication, like wine enthusiasts as ranting about rosé for more than just five years, but you look at lifestyle publications like fashion magazines, like Vogue, starting to write about rosé I think about four or five years ago. Now every year, more and more fashion magazines are talking about rosé. They are not just talking about the wine, they’re talking about the color. That is something we didn’t touch base on, but that’s also very, very important. One of the reason of the success of this category of wine is simply the color, it’s just pretty. It’s a trendy color right now, [inaudible 00:32:11] been pink. SK: Millennial pink, is that right? PB: Yeah, yeah. And so, it definitely makes people dream, it makes people feel like the [inaudible 00:32:24] this wine to their parents’ wines, that’s also very important as well. SK: That’s a good point. You did touch on that earlier and I think it’s worth talking about. In the American market, there was such a negative perception of rosé for so many years because of White Zinfandel, because there were wines that we, not being French and not having maybe the access to the great wines that you had growing up, our parents, I guess, would be more … our parents, they were drinking White Zinfandel. That is something that I think finally, in our market, our culture, is working its way out, younger wine drinkers don’t have the fear of rosé that maybe older people do. PB: Yeah. What’s very interesting in the US market compared to the French market is, rosé is a premium wine. I call it here the champagne of the millennial because it has been branded only recently, we’re talking five years. While in France, it’s been a while, it has been on the shelves in the super markets for a very long time. Usually at the bottom part of the shelves in a pretty low price point, that’s what I remember from my childhood in France. It’s still there, but also in France it’s starting to get a bit more premium as well. I think one winery that is above all these [inaudible 00:33:52] great job at positioning this category. PB: The Spring Angel. But, it was not easy for them, you know? They worked hard for 10 years before really getting the Spring Angel into the hands of the people and the restaurants and the retail stores. But yeah, I mean they brought a premium rosé, you know, a $19 to $25 to the markets, so more affordable than the Merlot or [inaudible 00:34:21] already on the market for many years. And, they kept pushing these brands and they kept pushing these brands, now they’re introducing new brands, Rock Angel is next. Rock Angel is a Provence rosé in the $30 to $40 price range. Rosé’s getting more premium. SK: Do you think that rosé is a trend that will end or do you think it’s here to stay in this market? PB: I think it’s here to stay now. What might be a trend is it’s all aspect of rosé, you know, having all these fashion publications talk about rosé all the time when summer kicks off. This might actually stop at some point when rosé would be at a level that it’s big enough. I mean the thing about in France, we drink more rosé than white wine, we are still far from being there in the US. I don’t think it’s a trend, we talk a lot about the seasonality of rosé, I believe that rosé can be enjoyed all year long. However, one might also the success of this wine is probably its seasonality because people get so excited about the idea of drinking rosé outside in the summer times, but it’s still a seasonal wine. SK: Well, and I think it is a wine though that it can be drunk year round, enjoyed year round. It’s an easy wine to choose and know that you will have a good experience with it, which I think is … you know, that’s obviously perfect. Most wine drinkers, I think, don’t want to have to worry too much about what they’re drinking. They want something good, obviously, they want a good price, but they want to fall down a rabbit hole too much with it and I think that rosé as a category has that … I feel like rosé as a category has been pretty innovative in its marketing and how it is sort of presenting itself, the meaning of producers and different categories. Don’t you agree? PB: Yes, definitely it is the category of wine that has seen a lot of creative ideas from the packaging aspect. So, we’re seeing a lot more of rosé in a can, and we see much more rosé in a can than the white or red in a can. The wine in a can movement has been growing, but rosé in a can is definitely getting bigger and bigger just because rosé is a wine to be enjoyed by beach, in an outdoor environment, so it’s great a … in my opinion, as long as the wine in the packaging is good. PB: And we’ve seen also fun concepts as far as brands. The first one I think about is summer water, you know from those girls, yes, we’re rosé that started this, yes, we’re rosé movement, then they started selling [inaudible 00:37:14] on their website and sharing beautiful pictures of drinking rosé. We’re talking about the lifestyle of drinking rosé, like these other girls who also started it. So, now they launched a wine called Summer Water, Californian based, quite interesting wine and if we did have the following community behind it, so it’s interesting. We’ve seen a wine coming up this year called Rosé All Day which has been one of the most used hashtags when people post pictures on the internet. And so, someone just launched a Rosé All Day wine. And, just for a little scoop, we are launching own brand, it’s called Rosé S’il Vous plait and I didn’t want to come up with a typical rosé so this actually a rosé mimosa, it’s a rosé cocktail and I think the category is open to new and creative ideas like this. We want to target maybe a younger generation of drinkers with that, that would then drink Corsican, Provence rosé, [inaudible 00:38:25] rosé, but maybe Twitter’s into rosé with rosé mimosa. That is not too sweet, very important to mention because the market is asking for dryer and dryer wines. So, yeah. SK: Okay. So, I have one more question for you. This might be slightly loaded, so get ready. We were talking earlier about, I think, initially when rosé starting growing on the American market. It was perceived as a female wine because of the color. So, what would you say to a man, especially maybe macho American guy saying, “I can’t drink rosé, I’m not going to stand here with a glass of pink wine in my hand.” Do you think that’s changed? PB: Yeah, it’s changing. [inaudible 00:39:09] we’re seeing more and more men drinking rosé on the terrace of cafes or at our events also. What I would do and what I would say is, I would blind test this person and challenge this person to tell me if it’s a white wine or if it’s a rosé. It’s actually pretty funny to do at home where sometimes it’s really difficult when you’re blindfolded to differentiate white wine from a rosé. Then it’s a matter of the color. But the color is part of our culture now, so I feel like men are more confident about wearing pink and drinking pink. SK: Right. I agree. I think we’ve evolved, which is a good thing. Well, I would like to toast you. Good luck with your advance and we’re excited about rosé and I’m sure we’ll be talking to you more as the category grows. So thanks. Speaker 1: This podcast is produced by Larj Media. L-A-R-J Media. Wine Enthusiast is made possible by grapes, sunshine, and wine, and by the hard working editors who bring you news and information on your favorite beverage everyday. If you like what we’re doing, share our podcast with your friends and give us a review on iTunes, or wherever you get your podcasts. For more fun wine information, follow us on Twitter and Facebook at WineEnthusiast.